Azura Sun, the game's developer who is also known as Sik of our own GOL community, was kind enough to provide a copy of the game for review purposes and so I dug in and put together my thoughts on the game. Getting the boring technical bits out of the way first; Sol runs well on my machine. It should run well on almost any machine made in the last decade or so. Its minimum requirements call for just 128MB of ram and basic OpenGL support. It's also an SDL2 title, meaning that if the keyboard isn't good enough for you, nearly every joystick and gamepad should work just fine with it. Not only that but the game also supports playing with a mouse and even has support for one-button gameplay for players with mobility issues. The first impression Sol made upon me was with its art style. It seemed to recall a bygone era of colorful platformers that were the staple of both console and PC in the early 90s. Think Sonic, Giana Sisters (original 1987 title) and the like. Regrettably, unlike many new games with retro styles, the designs aren't as detailed and quite up to par with some more modern sprite-based art. While the graphics certainly do have their own certain happy charm, it is certainly one of the game's weakest points. The game does its best to show off a wide palette variety in both objects and backgrounds but ultimately can't escape the fact that it often looks dull or just outright not very pretty. I found a few enemies and objects to look a bit simplistic. In addition, I found some of the boss designs to be rather uninspired and too similar to other bosses. My issues with how the enemies look aren't all negative, however. Enemy types are easily recognizable. At a quick glance you can tell which enemy is which by its outline and therefore how it's going to behave. In a game where you may have to make a split-second decision where to jump and land this is very useful. More than once I was able to avoid dying because I knew where toxic smoke was going to be blasted or where an explosion was going to occur. Musically, the game doesn't stand out. The soundtrack is competent and never got on my nerves. Each song is appropriate to the area it's played and feels right for the game. Sound effects have been appropriately chosen and there's nothing in there that's annoying or out of place. Jumping, hitting an enemy, using a giant spring to launch up in the air all sound as expected. The game is unambitious when it comes to story. There is a bad guy and he has an army of robots that are wrecking up everything. Cue the headstrong heroine not standing for all the ruckus and deciding to get to the bottom of things. This lack of ambition isn't a bad thing by any stretch – the uncomplicated plot and clear cut heroine and villain is a sharp contrast to the usual glut of platformers that pretend to be something more than what they really are. In Sol's case a bit of dialog, bits of humor and brief explanations is all that's needed before stomping bad guys. Not everything has to be about prophecies, past lives and the like to be enjoyable. Mechanically, Sol also hits the right notes. With only really the jump button to worry about, the game focuses on mostly getting the platforming right. Enemies die when jumped upon and the player dies when they lose all their health as a result of enemy contact or environmental hazards. 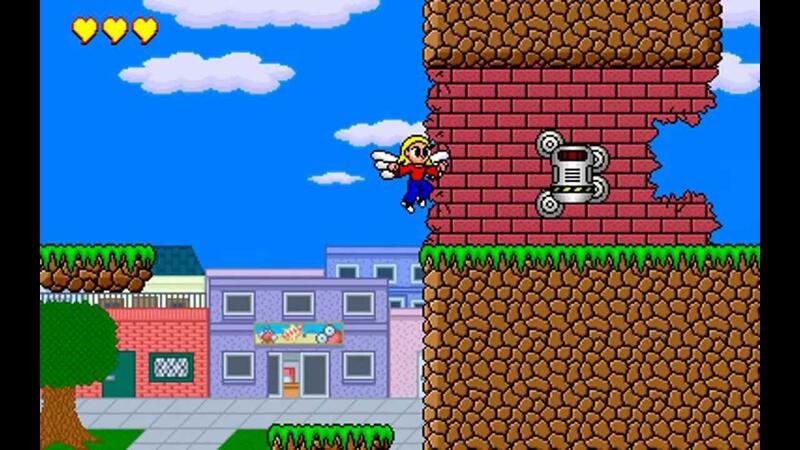 There are power-ups that help the player by letting them break blocks, jump higher or climb walls as well as shield them from damage; these help but are in no way necessary to complete stages. What mattered the most throughout the game was my own skill more than luck or the right combination of items. Personally at first I found the game super hard, too much inertia, checkpoints too far apart, and it took me a long time with several ragequits to finish the first level . I played a little of the beta a while back and it reminded me a lot of Superfrog with its huge levels and myriads of secret passages. Very impressive for a one person effort.